Obviously we have our fair share of struggles, failings, worries, are in need of and receive much Grace everyday. As I replied to Rhadonda in the last post's comments, there are lots of frantic paddling below the water, haha! But God is mighty and He covers our shortcomings and help us make beauty out of ashes, and on this scrapbooking blog I try to celebrate all the goodness. My husband and I were discussing if we would have a goal or theme for our family this year, what would it be.. and he brought up the idea of WARMTH. Warmth in our everyday living, Warmth as you find in being human, as opposed to the computerised world, Warmth in patience, Warmth as in accepting imperfections, cutting each other some slack, expecting mistakes or that the best plans can go wrong, Warmth in giving grace and being kind and making time, Warmth as in "it's okay", "take your time", "that's alright". And so much more. I love this idea, especially for our fast paced, super packed, short-tempered, modern-day lives. 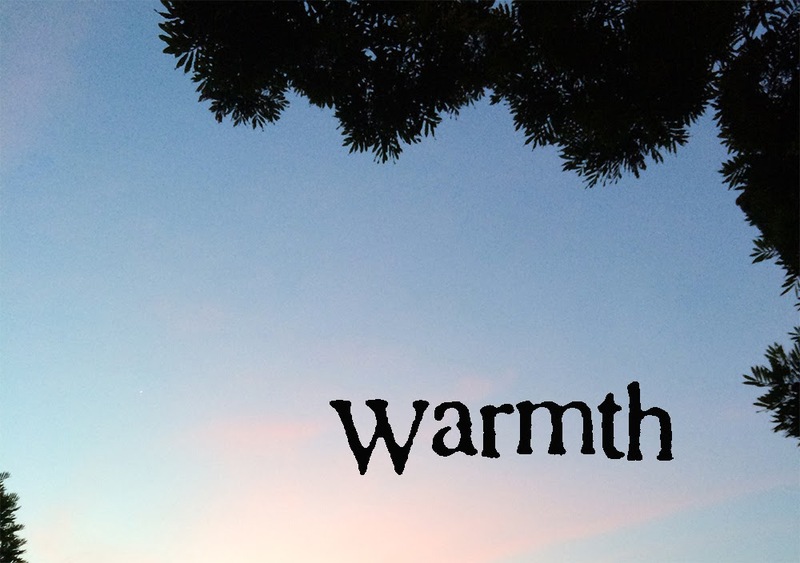 Practice warmth. 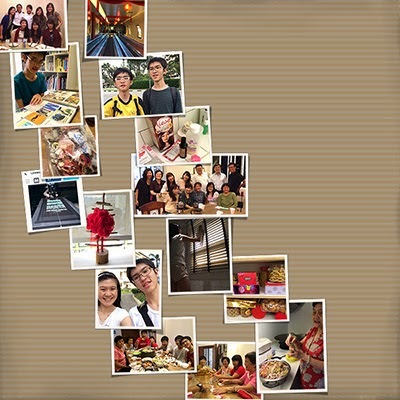 I really think that memory keeping helps me live more thoughtfully. Looking backwards and reflecting always inspires me to to look forward thoughtfully and purposefully. 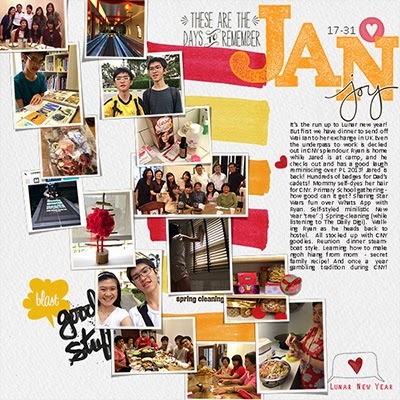 As I uploaded all my 2013 Half-monthly layouts to Pernisckety for printing last week, I can't help marveling at how an entire year was spent, what we did, how much we were blessed, the new, the challenges, the mundane, the laughs, the memorable, the friendships, the fun, the important, the trivial, the growth. How will we remember all of it without memory keeping? And I want to challenge you to do this - you can use my templates (available in the store or download the free sample further down this post) or any others, take photos everyday and save them on your phone, (I use Project 365 app, there are many others, where you can collect them by date and type a short note if you like) and at the end of the month take a couple of hours to lay them out. It is totally do-able and so very precious! It took me 10 minutes to select 15 photos from the 264 photos I have uploaded from my phone to the January folder on my computer. 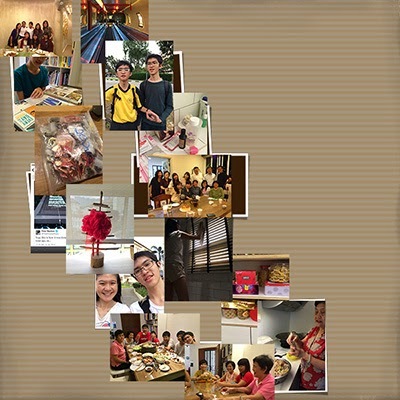 This process is helped by referencing my Project 365 App where I had already selected a photo to save under each day. In the next 3 minutes I simply moved each photo layer over to the photo spots in the template that I think will work - visually this helps me decide which photo should go where. In the next 14 minutes I 'processed' (adjusted the lighting or brightness) of my photos and 'clipped' them to the respective photo mask layers in the template. Now this is where I can spend the most time if I get carried away. Selecting the papers, alpha and elements - the fun part! It helped that I already knew I wanted to use Kaye Winiecki's Base jumpers markers papers for my P365 layouts when I bought them last week. For the elements and alpha, I looked through the last month's newly downloaded/purchased files, opening only those that have similar color schemes, picked out a few elements and word art and dropped them into the file. It took me 21 minutes apparently! 11:52 - completion with journaling done! And finally, it took me 14 minutes to type my journaling (it did not seem that long when I was typing it), add the date and the half month in review is complete!! 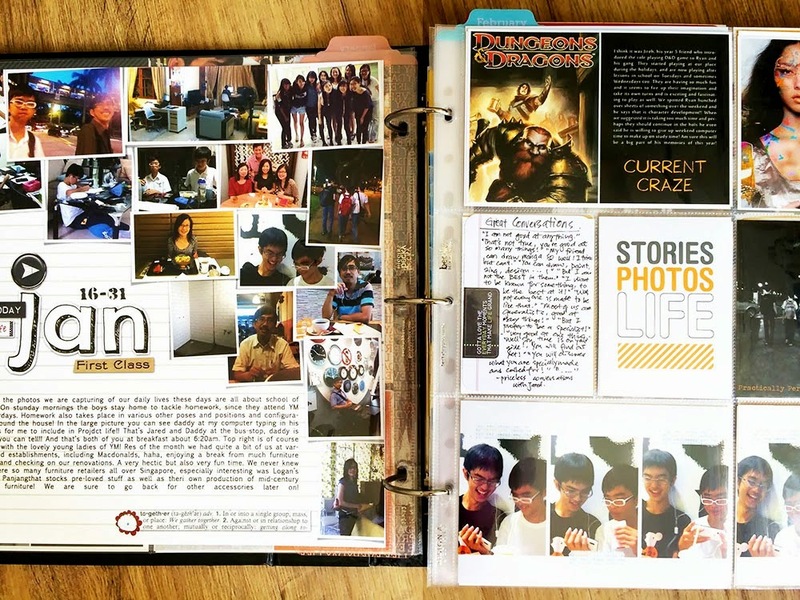 This is how the 2013 pages look in my Project Life album! And this one that I used in the process example above can be downloaded here. I hope you catch on! (wink) Love to hear what you think! 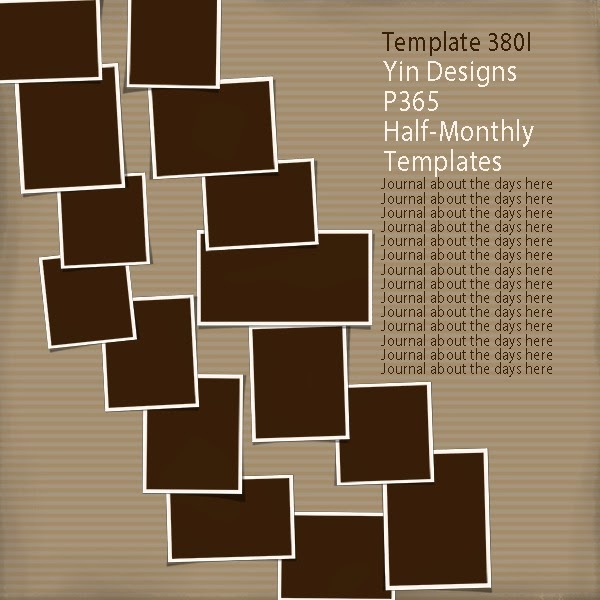 And you can sign up for my Yin Designs Newsletter Here - where you'll be updated on freebies, sales, new templates and so on about once a month. Thanks for your interest! I will post the link to this in the next newsletter (couple days' time) and also in the next few months' newsletters. Look out for it! Thanks for the fantastic templates! (plural, since I came here from Digi Scrap.) And thank you for your "disclaimer." Sometimes other peoples' lives look so good, and then I have to ask God's forgiveness for coveting. God is good, and His plan is for His glory and our good. I look forward to learning a lot and being inspired by your blog. Thank you so much for the template. I love your templates. Thanks for sharing your process. I struggle so much with picking out the papers, etc. That takes me the longest. Your templates make it so easy to get started and it looks so great. I like the half pages as I print through Persnickety and put in 3-ring notebook. I wish my process went that quick, I need to work on that. Thanks for the inspiration and as always the honest sharing of the heart! His Grace and Mercy carries us through so much as well... thank God for His Grace and Mercy! Thank you for both templates! Love them. Thank you for sharing your process & the template. It's always good to see how others approach the creation of a page. Really lovely and I am a Daily Digi subscriber and was THRILLED to nab that template as well. Thanks!!! Thank you once again for sharing your templates. I had to stop my blog because of my son's need for privacy. I think, quite often, that the young are more careful of what they/we put out online than we are. Hi Yan, I remember visiting your blog in the past, wow you stopped blogging completely? Yes, we may think we are just sharing fun bits of our lives, but they may feel that those are moments they rather not share on the web. But they will share all kinds of other thoughts on FB too, we just have to be very sensitive to their sense of privacy. Thank you so much for the templates! I enjoyed seeing your process for creating your monthly page. I get so bogged down in embellishments & papers that I allow myself to get overwhelmed at times. I appreciate the simplicity of your process. Thank you for sharing your wonderful talents. I enjoy your posts so much. Thank you, I'm so glad you enjoyed them! Just discovered your blog today via a freebie on the Daily Digi. I have been following Cathy Zielske and Becky Higgins and a few others for years, but I think I may have just found a new all-time favorite! Your work is amazing and inspiring! What a treasure you are creating for your family. I was wondering how you created that double-page look in a photo book and it didn't take me long to find some of your posts dedicated to that topic. Again, a treasure trove of information and lessons-learned for your readers. Thanks for your wonderful encouraging comment! Thank you for sharing your process. It takes me at least that long to complete a LO. I always think I am so slow.! Thank you for sharing your life and template expertise with us. In case I haven't said it before . 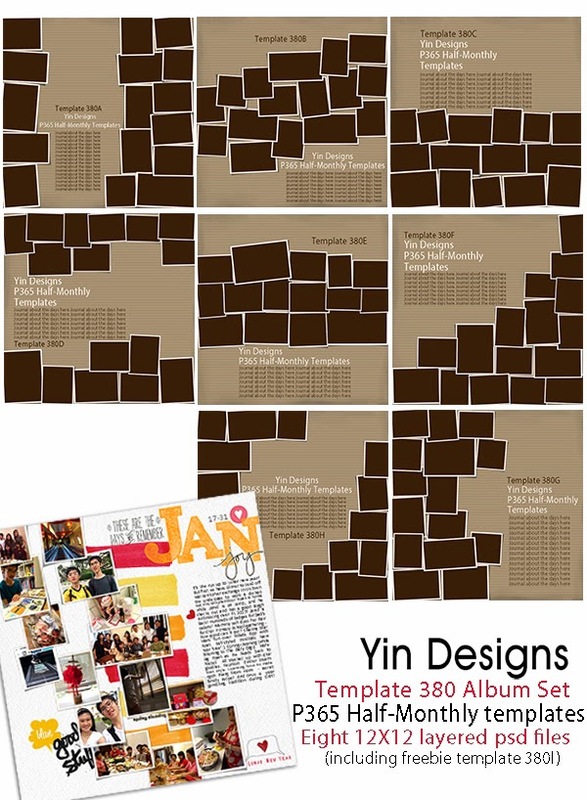 . . thanks for sharing your templates with us! 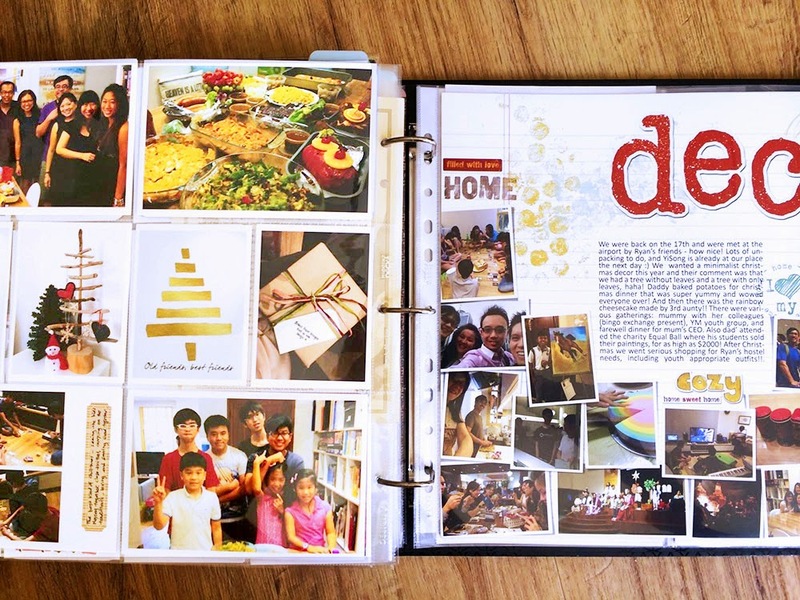 It has made my scrapbooking so much easier and faster. I just came across your blog and I am in heaven!! I love that you use lots of photos that aren't all super tiny and hard to see. I also love that you use little embellishments and that you do double page layouts. I can't wait to do some new layouts! I was wondering if you could tell me where I might be able to purchase some of the cute lined papers and fun alphas that you used in your 2013 Half-monthly layouts? Thanks!!! Thank you! Thank you! Thank you! 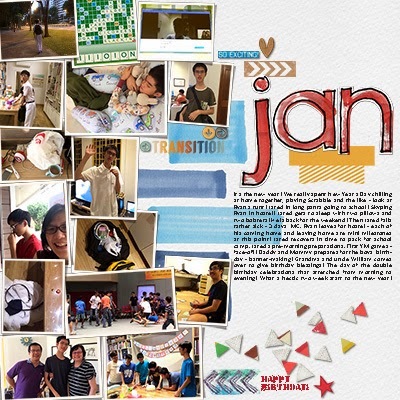 I have already finished some layouts using your wonderful templates!